Brand Mapping for positioning products. Retail Gravitation Analysis to points of sale. Descriptive Statistics including Box Plots and Pareto (ABC) charts. Smart Mapping with bubble charts and labels. Comparative Mapping with quadrant analysis. 4 dimensional chart draws pin bubbles in 3 dimensional space. 14 methods for short term forecasting with the Forecast Manager. Cross Tab professional contingency tables. Computation of sample sizes with the Sample Manager. Significance testing between proportions with the Proportion Analyst. Benchmark Analysis comparing brand performance, companies and competition. Stacked charting for time series presentation. 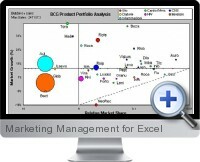 Profile Manager makes market share estimates and impacts of new products. Segmentation Tree for market segments in tree format. Decision Tree analysis computes complex outcomes and expected value.